* Deane is away in Napier for work, it's raining, and I have to walk the kids half an hour to school. You may recall (as mentioned in previous posts) my kids are the complaining type. * Current landlords are leaning on us (rather heavily I might add) to give them a date for when we will be vacating. Point to note: we were previously under the impression that when our lease expired on 27th February, if Deane had not yet found a job in Auckland, they would be happy to extend further into April if required. They changed their minds. Suddenly these new tenants have materialised and although they are flexible to the point of not needing to move in until early March, they would prefer to move in as soon as possible. They need their answer by 5pm. Crap. * Discover via free community newspaper that the high school right next door will be starting a huge $6 million demolition and rebuild project in April. Suddenly things start making sense (and I pity the poor tenants moving in after us. Not only will they be paying more rent, they'll have to deal with building noise and mess throughout their tenancy). * Most of the places we look at are ridiculously small (how they can call them two bedroom apartments and get away with it I'll never know - try single bedroom with study and no walking space!!) and of course require 12 month leases. We find one apartment suitable, about 1km from the school. We have to wait to hear if we'll get it though, as they're showing through more prospective renters later in the day - they'll get back to us in the evening. * Get a text re aforementioned apartment saying "sorry, we can't give you an answer yet as we are showing through some more people tomorrow evening - we'll call you back then"
* T wakes up with a wicked temperature and starts throwing up - this continues for the majority of the day. X still has that abominable cough. * Asked Deane no less than six times to get boxes (he said he had some at work) - they didn't materialise. As yet packing has not commenced. * Haven't heard anything by 9.30pm so send a text re apartment asking "any news?" Go to bed still wondering. * Kids are home sick - don't want to inflict awful sickly germs on the rest of the school students. Yay. On the positive side, at least we won't be homeless :-) Still no news about the Auckland thing (hopefully will hear about that this week) but I'm not going to worry about that at the moment. There's still an overseas trip to organise and prepare for. That's about all I have to share at the moment. 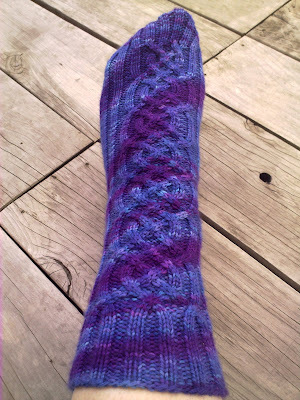 You may recall the very awesome socks I was knitting for myself out of that lovely Needle Food sock yarn. 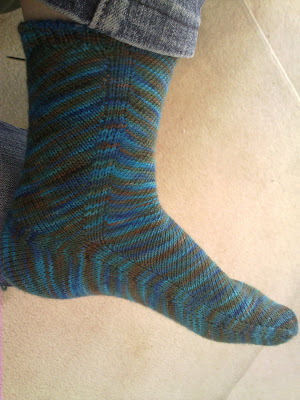 Well, I haven't finished the pair yet, but I have finished one sock! Ta daaaaa!! Please note: funky colours in pictures are not a true and accurate representation - cameras, lighting and computer screens can change things a lot!! School is well and truly underway again, and T is having some issues settling in. I think he's just a little tired - hopefully he'll improve over the next couple of weeks. I promise to try and avoid making a nuisance of myself by hanging around the school and spying on him to see if he's behaving - I have to admit, this spying business really eats into your personal time!! Although I have managed one measly run so far this week - all of about 2 1/2 k's, pretty sad. Oh well, better than nothing, huh? I'm making excuses again, like "ow, I had my travel vaccinations today and my arms hurt" (not that they're required for running, but you get the gist). Or in my case, my 5 and 7 year old boys. 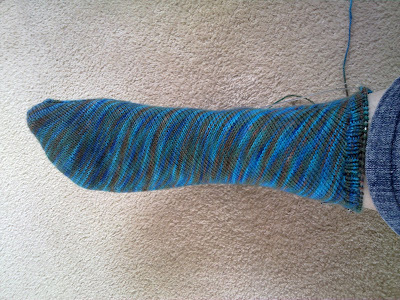 The other day I was sitting on the couch knitting a sock. The horrors were playing Lego Indiana Jones on the XBox. With one ear on their rambling conversation, I noticed T talking about the camels in the game. But the word 'camel' sounded a bit odd, not quite right. Me: what's your favourite flavour chocolate? Me: what's that animal with the hump on it's back? Me: are they the same word? There have been many others, but as the boys grow up, they slowly learn the correct pronunciation. It's sad in a way. I'm going to miss all the funny little words they come up with. They're off to school on Friday (two more sleeps!!) - everyone is looking forward to it. All their books are covered, labelled, and packed in their schoolbags with their pencil cases full of new felt pens and coloured pencils. Everything is organised and ready to go - woohoo!! Blissful, quiet days are on their merry way. Which will mean getting back into running, and more knitting and housework time. I'm really starting to miss going for a run in the mornings, so it'll be nice to get back into it. Knitting hasn't suffered too much in all fairness, I've still managed to get quite a bit done during the school holidays. I finished my special secret project with plenty of time to spare, but you'll just have to wait for a peek at that one. 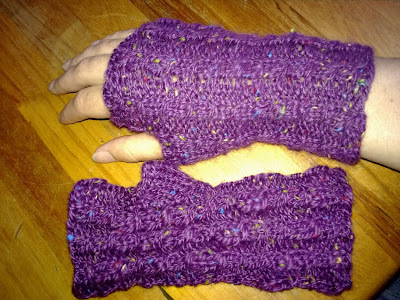 I whipped up these cute little cabled wrist warmers in a couple of days using a skein of Peruvian yarn given to me last year by one of the angels in the Harry Potter swap. They're so soft and cosy, I can't wait until winter so I can actually wear them! 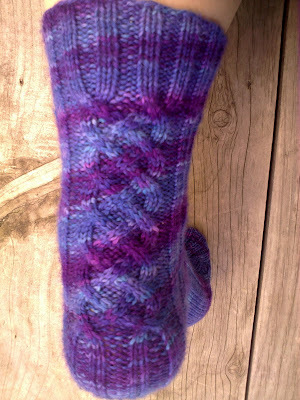 I'm a little bit further along than this now - just past the heel, and onto the foot. 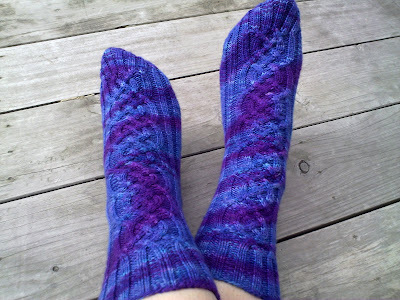 These are being knit one at a time because the cables require a bit of concentration, and they're different on each sock (cables twist in opposite directions) so I thought it would be safer that way. Cables are not fun to tink back!! 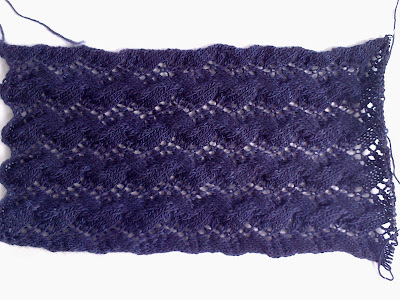 Also on the needles is my mmmmmmmmalabrigo lace scarf (oh, such divine yarn!!). 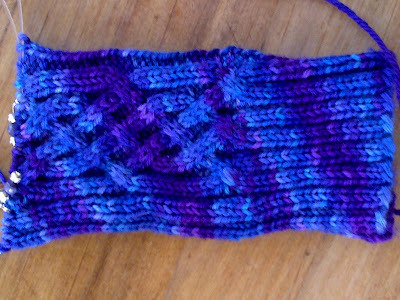 I only started this morning, and have done only one pattern repeat so far. It's an easy pattern to memorise, but it's going to be a long process. Still, no hurry (the benefit of making stuff for yourself). I'll post a progress pic a little later on, when there's more to show. Went and visited a new yarn store the other day - well, the store is new, but the owner has had a website for some time - Knitting Pretty. She stocks quite a range of sock yarns (and other yarns of course) - I just had to get a ball of TOFUtsies - it's a blend of 50% superwash wool, 25% soysilk fibres, 22.5% cotton and 2.5% chitin, which is made from shrimp and crab shells, and is naturally antibacterial. Not that I have a problem with smelly feet... But apparently it's also good for people with poor circulation. I always have cold feet in winter, so I guess I'll be testing that theory ;-) I decided to get a solid colour for a change (sock yarn is almost always variegated or semi-solid) - lime green!! 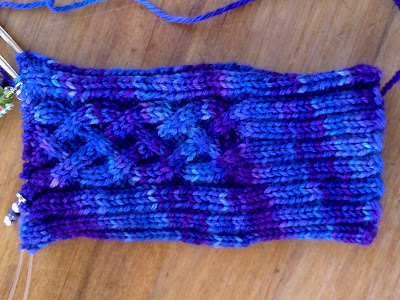 Should make for an interesting pair of socks.